There’s an old saying: “What’s sauce for the goose is sauce for the gander.” The meaning is obvious — if you insist on something for others, you have to be prepared to hold yourself to the same standard. A version of that is playing out in Europe today. And right now the strongest signal is not coming from Germany — it’s coming from Italy. Italian banks are in deep financial distress (as were banks in Cyprus and Greece from 2011 to 2015). 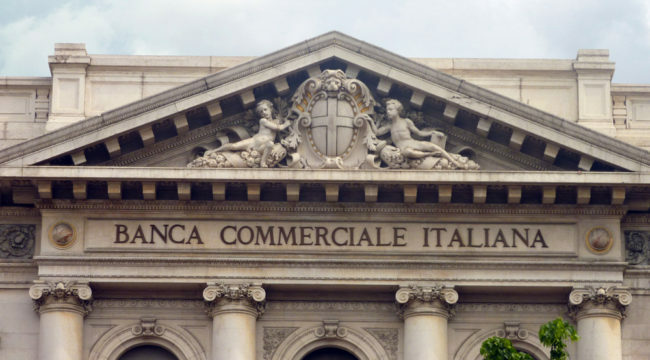 This involves the Banca Monte dei Paschi di Sienna (BMP), the world’s oldest bank still in operation, founded in 1472. Monte Paschi’s trouble began in 2007 when it agreed to buy another Italian-based bank, Banca Antonveneta SpA. It offered 9 billion euros in an all-cash deal just as the global financial crisis was unfolding. The deal proved a disaster for Monte Paschi. It damaged its ability to withstand losses following the 2008 crisis. Then investment bankers stepped in and sold Monte Paschi derivatives contracts that ended up hiding the bank’s surging losses from regulators. These deals only weakened the bank’s shaky finances. BMP’s derivatives blew up because they made losing bets on the value of Italy’s country’s government bonds. The bank has suffered 15 billion euros in losses since 2009 and seen its stock fall 99%. BMP was the only major bank to fail the European Central Bank’s (ECB) recent stress tests. It was required to raise capital as a result. The efforts to raise capital have been led by JP Morgan and a syndicate including Goldman Sachs and some Chinese banks. JP Morgan won out over a rival plan by veteran Italian banker Corrado Passera. The plan called for selling about 28 billion euros ($31 billion) in bad loans and raising 5 billion euros in new capital. But reports suggest that the capital raising effort has not gone according to plan. Monte dei Paschi needs to complete the effort by the end of December. That seems unlikely since Italians are voting on a constitutional referendum which could unseat the government this Sunday, Dec. 4. The government endorses the plan. Italy wants to bail-out BMP with taxpayer money. That’s the standard playbook that governments used in 2008. But the rules have changed. Angela Merkel, the Chancellor of Germany, is taking a hard line by insisting that there will be no more government bailouts of banks. In fact, that’s the official position of the entire G20 as disclosed in the final communiqué from Brisbane in November 2014. They decided that bail outs would be replaced by “bail-ins.” In a bail-in taxpayer money is not used to recapitalize the sick bank. Instead bondholders and depositors take haircuts and are involuntarily converted into equity holders. Imagine if you had $500,000 on deposit at the bank and you got a notice in the mail that said your deposit was now $250,000 (the insured amount) and the other $250,000 had been converted into stock in a “bad bank,” which might or might not produce returns in the future. That’s what happens in a bail-in. If you read their final communique, you’ll find the blueprint. In the next financial crisis when these global too-big-to-fail banks are under stress, they’re not going to get bailed out with taxpayer money because the leaders know that’s too unpopular. There’s going to be a bail-in. They’ll use the money already in the bank, whether it’s depositors, bondholders, or equity holders, and use that money to repair the balance sheet. We’ll see financial institutions taken over, and losses will be apportioned between depositors, stockholders and bondholders. This means bondholders take haircuts, uninsured depositors get new equity, and existing equity holders get wiped out. There’s only one problem. Merkel is applying this rule to Italy, but now the biggest bank in Germany, Deutsche Bank, is the one that’s in trouble. In order to maintain her hard line, Merkel will have to apply the bail-in method to Deutsche Bank. That means a bloodbath of losses the market is not ready for. It’s time to get ready because a panic is coming. If Germany forces Italy to bail-in BMP, then Italy will insist that Germany also bail-in Deutsche Bank when the time comes. Both banks are too-big-to-fail and are failing, but BMP is closer to the brink. It’s the “canary in the coal mine” for Deutsche Bank. Germany won’t like that, but if they don’t bail-in Deutsche Bank, the European Union will come apart because of acrimony between Italy and Germany. Compared to this dispute, UK Brexit is a sideshow. Greece is a sideshow of a sideshow. Italy is the real deal. If Germany and Italy can’t cooperate, then there is no European Union. Markets won’t wait while German and Italian politicians tiptoe around the bail-in question. They will draw their own conclusions and start a run on Deutsche Bank. That will take the stock down another 90% on top of the multiple crashes that have already occurred. The German government will let Deutsche Bank stock fall to €2 before they intervene. That’s how existing stockholders make their “contribution” to the bail-in. Deutsche Bank won’t fail and the stock won’t go to zero. But there’s still plenty of room to fall. As for BMP, I expect Italians to vote “no” on Sunday. First Brexit, then Trump, now the next anti-establishment shoe to drop is in Italy. It won’t necessarily lead to the collapse of the euro or the immediate demise of the European Union, but it’s clear the revolt against the globalist agenda continues. The question is, how hard will the elites fight back? James G. Rickards is the editor of Strategic Intelligence. He is an American lawyer, economist, and investment banker with 35 years of experience working in capital markets on Wall Street. He was the principal negotiator of the rescue of Long-Term Capital Management L.P. (LTCM) by the U.S Federal Reserve in 1998. His clients include institutional investors and government directorates. His work is regularly featured in the Financial Times, Evening Standard, New York Times, The Telegraph, and Washington Post, and he is frequently a guest on BBC, RTE Irish National Radio, CNN, NPR, CSPAN, CNBC, Bloomberg, Fox, and The Wall Street Journal. He has contributed as an advisor on capital markets to the U.S. intelligence community, and at the Office of the Secretary of Defense in the Pentagon. Rickards is the author of The New Case for Gold (April 2016), and three New York Times best sellers, The Death of Money (2014), Currency Wars (2011), The Road to Ruin (2016) from Penguin Random House.